Southern University and Agricultural and Mechanical College, Archives and Manuscripts Department (Baton Rouge, LA) – John B. Cade Library has a collection, Opinions Regarding Slavery: Slave Narratives, 1822-1865, available online. These are organized geographically by state/territory. The 1935 Prairie View Slave narrative collection contains 17 states including the Indian Territory and Canada. Alabama, Arkansas, Florida, Georgia, Indian Territory, Kansas, Kentucky, Louisiana, Maryland, Mississippi, Missouri, North Carolina, Oklahoma Territory, South Carolina, Tennessee, Texas, Virginia and Canada. You can access the full finding aid. Each narrative can be accessed as a PDF. What other collections of slave narratives are you aware of? 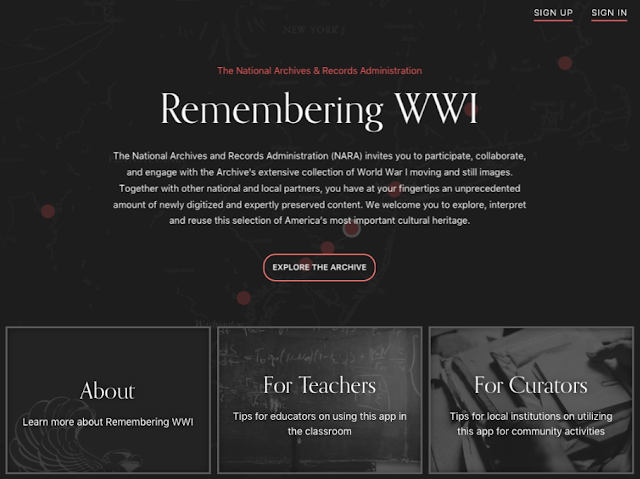 Today we’re launching the public beta program for the Remembering WWI iPhone app, which puts newly digitized primary source materials into the hands of teachers and museum professionals nationwide. The app is a product of a two-year collaboration among the National Archives, the Library of Congress, the Smithsonian Institution, the National WWI Museum, and others, all working toward the goal of connecting teachers, students and history enthusiasts to primary sources in interesting new ways. I’ve written a few times about the moving and still images related to World War I and II that have been part of a large scale digitization effort at NARA over the last few years. In addition to the digitization of these rarely-seen photographs and moving images, this app is part of a long-term community engagement plan to connect with existing and new audiences for NARA. On our NARAtions blog, the team has shared how we’ve taken a user-centered design approach to one of our first cross-unit productions, and opened up our collections to free and creative reuse. We welcome your participation and feedback in this beta program for the Remembering WWI app. The best way to get involved is to join the conversation on the History Hub, where you can learn about downloading the beta app, participate in user experience research, and share your feedback and ideas to help inform changes to the app before being promoted in schools and museums in February 2017. Here is the link for it in Itunes. I don't see an android version yet available. You can explore a Sample User Journey for WWI app here (PDF file). What feature did you like best? If you were a teacher, can you see using this in your classroom? When traveling, how might you use this? This post starts a periodic series where we, at NGS, highlight the various competitions (15 December deadline) and awards (31 January) where nominations are sought in order to recognize excellence. The winners will be announced at the annual NGS Family History Conference, 10-13 May 2017. Nominate your own or someone else’s publications that meet the stated criteria. NGS membership is NOT required! Please let those who have published a possibly qualifying book, in the last three years, know about this award! What Genealogy or Family History Book Would You Like to See Nominated? Many genealogists and family historians become the “keepers” of invaluable family papers, images, heirlooms, and more. Essentially, we main mini libraries and archives. As such, when disaster strikes, it’s important that we know what we should be doing to preserve our priceless collections. The app provides the same reliable content found in the original Wheel, outlining critical stages of disaster response and provides practical salvage tips for nine types of collections, from photographs to natural history specimens. Let’s make sure that we keep the family history materials entrusted to us safe if an emergency strikes. What emergency response element did you learn that surprised you? Have you previously had an emergency (e.g. fire, flood)? How did you respond? 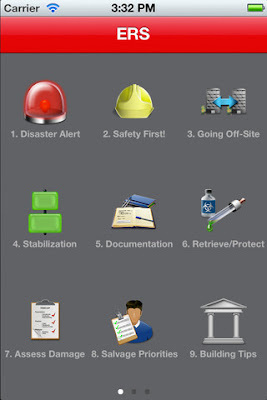 Editor’s Note: Read past Upfront with NGS blog posts about emergency preparedness here, natural disasters here, and preservation here. Our friend The Legal Genealogist, Judy G. Russell, in her post, Shining a light, introduces us to this HeinOnline database. This HeinOnline collection brings together, for the first time, all known legal materials on slavery in the United States and the English-speaking world. This includes every statute passed by every colony and state on slavery, every federal statute dealing with slavery, and all reported state and federal cases on slavery. Our cases go into the 20th century, because long after slavery was ended, there were still court cases based on issues emanating from slavery. To give one example, as late as 1901 Chief Justice Oliver Wendell Holmes, Jr. of the Massachusetts Supreme Judicial Court had to decide if a man, both of whose parents had been slaves, could be the legitimate heir of his father, because under southern law, slaves could never be legally married. I suggest you read her post and follow the instructions as given. Doing that, I was able to successfully register for and receive database access. A neat feature is that for any found article, you can get the full citation (click the Cite box in the upper left near Show table of Contents) in MLA, APA, Chicago or Bluebook formats. Since I’ve spent the last hour just looking around in this database, I’m just going to post this so that y’all can get yourselves signed up and do the same! If you discovered some element of slave law that you were unfamiliar with previously, please tell us about it. If an ancestor of yours is explicitly mentioned, share the context. The Richard S. Lackey Scholarship is awarded annually to an experienced researcher active in a paid or volunteer position which directly benefits the genealogical community. This year the scholarship will award $600, which covers full tuition for the Genealogical Institute on Federal Records (Gen-Fed), and partly defrays hotel and/or meal cost. The Gen-Fed Alumni Association will also provide meal coverage at the Gen-Fed Alumni Banquet on Friday night, July 14, 2017, where a check for the amount less tuition will be presented to the recipient. For more information about the Institute, visit www.gen-fed.org. The application can be downloaded from the Scholarships page. A complete application must be received by midnight 15 December 2016. The winner will be notified by 15 February 2017. The scholarship winner will automatically be accepted for the Genealogical Institute on Federal Records to be held at the National Archives in Washington, D.C., from July 10-14, 2017."